We are proud to present our range of quality 21st Birthday Keys to celebrate that very special occasion. 21st keys are a custom unique to the southern hemisphere. These keys are given on the 21st birthday symbolising a coming of age. These keys are made of wood and are stained, the darker wood is a Mahogany finish and the lighter a Rimu finish. Each key has a cord attached to the back to enable it to be hung on the wall. The photograph can be inserted into the key by you (the customer) through a slot in back. We package these 21st keys very carefully and successfully send them to all countries. The wooden 21st keys are 48cm long x 18.5cm high. This Rimu covered photo album/scrapbook can be used for photographs and comments from Guests on the day. 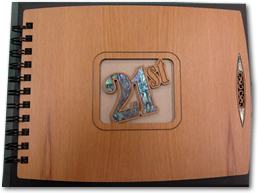 The 21 on the cover is inlaid Paua Shell. It measures 23cm wide x 17cm high. Includes 30 x A5 black card pages. 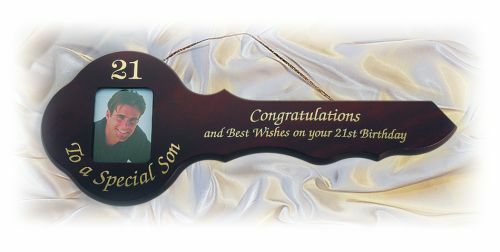 One of the very unique things about New Zealand, is that we consider the 21st birthday to be the significant becoming of age birthday. This is the time when family members gather and share embarrassing photos of a loved one. Later that day the parents go away and the party begins. This is a tradition that is as old as time itself. Some people believe that 21 is the important age in New Zealand because at one time you had to be 21 to vote and to drink in a bar. Ironically you have never had to be that old to go to war for your country. Technology certainly has its advantages today as our ex pats in Australia and other countries need only go online to order their birthday key, and have it delivered to the door regardless of distance.